Meizu has done it again. 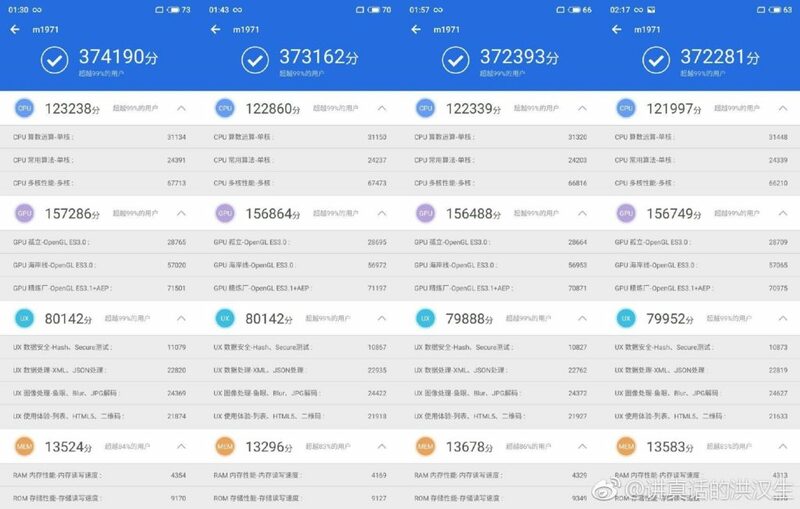 We have got the AnTuTu latest benchmarks for Meizu 16s Scores. Its getting all set to be launched anytime now. There were earlier scores reported at 358,000 achieved by 855 Snapdragon. With the latest scores it has taken ahead the performance to 371,000. This achievement can only be possible with optimization of overall components without increasing any of the hardware aspects. Its actually a combination of CPU, Memory , GPU & UX. The chart also shows that these numbers have outperformed ASUS Zenfone 6 & much talked about OPPO Reno 10X Zoom. The hype which got created in last few weeks over OPPO Reno 10X Zoom will be dented a bit with these results. The Meizu 16s version will take on its looks from its own predecessor Meizu 16 but with some notable differences on top & bottom. Will be good to see how ASUS & OPPO responds to it.